People wonder why their skin sags and develops wrinkles and lines with age. It really all comes down to the skin’s support system and the sun. Unfortunately, as we age, our body produces one percent less collagen every year. By the time we’re 50, our collagen production is 30 percent lower than it was at 20. Collagen is responsible for providing the structural framework under the skin, the framework that supports and keeps the skin firm. That’s half the battle. The other half is sun and environmental damage. As we go for more hikes on Mt. Hood, skiing at Mt. Bachelor, or weekends in the sunny wine country, our skin accumulates more and more sun damage. The UV rays damage the epidermis and break down the elasticity of the skin. This dries the skin. Plus, it thins with age. Add all of that up, and your skin sags, forms wrinkles and creases, develops age and sun spots, and generally makes you look a lot older. 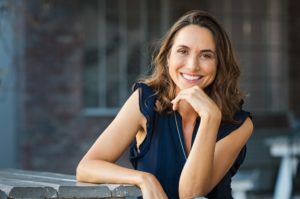 Since skin is what we do at the Center for Dermatology and Laser Surgery, we have a few ways to help you fight back against the aging of your skin, and to give your body’s largest organ a little rejuvenation. When you make an expression with your face, such as a frown or a squint, you can feel the muscles in the upper third of your face activate. This is the expressive area of the face. Wrinkles that form on the upper third of the face are called dynamic wrinkles. They form from repeated muscle contractions under the skin. Over time, as you make thousands and thousands of these expressions, a dynamic wrinkle forms atop the muscle. That’s where BOTOX and Xeomin come in. Both are injectables known as neuromodulators. They are made from the botulinum toxin type A and when they are injected in very small doses into a muscle, neuromodulators stop the muscle from contracting for a period of time. When you inject BOTOX or Xeomin into a muscle that forms crow’s feet, for instance, the botulinum toxin prevents the muscle from contracting by blocking the nerve messages from the muscle to the brain. When the brain doesn’t get the message to contract the muscle, the muscle stays relaxed, and the wrinkle that forms above it doesn’t form. Both BOTOX and Xeomin erase wrinkles for about four months before the muscle starts contracting again. They work on crow’s feet, the 11s between the brows, and forehead lines. As their name implies, dermal fillers simply fill in the depressed area under a wrinkle or area of volume loss. The most popular dermal fillers, Juvederm and Restylane, are made from hyaluronic acid, a naturally occurring substance in the body that is responsible for hydrating and plumping the skin. When these fillers are injected beneath a wrinkle, the hyaluronic acid binds with nearby water molecules, pushing the skin back upward and erasing the wrinkle or filling the area with volume loss. Synthetic dermal fillers are made from other materials, such as calcium microspheres, that provide a framework under the skin (basically supplementing collagen). Radiesse, Belotero, and Sculptra are all synthetic dermal fillers. Dermal fillers work on wrinkles that are known as static wrinkles. These are wrinkles that show themselves at all times — things like smile lines, vertical lip lines, marionette lines, etc. We provide all Juvederm and Restylane products, along with Radiesse, Belotero, and Sculptra for our patients. A newer rejuvenation method for the skin is to direct radiofrequency waves onto the skin. The procedure is called Ultherapy. In Ultherapy, the radiofrequency energy penetrates the epidermis and enters the dermis, the skin’s second layer, where it converts to heat energy. When the body senses heat in the dermis layer, it assumes there has been a wound, and it initiates a wound-healing response. This includes production of new collagen, plus a remodeling and tightening of the existing collagen in the area. Over the next few months, the body continues to produce new amounts of collagen, improving and tightening the skin. Ultherapy is a non-invasive alternative to a surgical facelift, without the recovery or downtime. At the Center for Dermatology and Laser Surgery, we use various lasers to treat different skin conditions. We use Intense Pulsed Light (IPL) for brown spots, skin tone, and areas of hyperpigmentation. For laser resurfacing, we use the Harmony High-Power Pixel Laser. This fractional laser is non-ablative, yet it resurfaces areas with fine lines and wrinkles, it reduces large pores, lessens acne scarring, and improves overall pigmentation and skin tone. You may not be able to stop the march of time and its effect on your facial skin, but you can fight back with the various skin rejuvenation procedures we offer at the Center for Dermatology and Laser Surgery. Call us at (503) 297-3440 to make an appointment.